I've been experiencing spring fever lately, so it seemed like a good time to pull a sample of some fun-and-fruity fragrance from my sample basket. I ended up with Plenilunio, a recent release from Italian niche line i Profumi di Firenze. Plenilunio's concept of "a voluptuous bouquet of summer strawberries" with "an enchanting kiss of silver moon beams on the skin" seems appropriate for the season. In addition to strawberry, Plenilunio features notes of mandarin, white musk, amber and soft woods. What you read is what you get, which is fine, actually; lately we've seen way too many poetic lists of fantasy notes ("'angel mousse' and 'gardenia spasms,'" as Angela sort-of jokes) dressing up the thinnest and most prosaic of fragrances. Plenilunio pairs a succulent strawberry note with a velvety vanilla. Imagine the olfactory equivalent of a trifle or some other satisfying fruit-and-custard dessert, add a touch of powdery musk, and you're set. This fragrance has moderate sillage and good longevity on skin. Basically, Plenilunio is a sweet, simple berries-and-cream scent that wears well. It reminds me of Hanae Mori's original fragrance (now known as "Butterfly"), although I don't have a sample of the latter available for wrist-to-wrist comparison. It might be too gourmand for the hot weather, when I'd wear something more delicate or sparkling to satisfy my red-fruit craving, like Annick Goutal Quel Amour! or Ava-Luxe's Sunday Girl. For these balmy late-spring days, however, it feels just right. Do you have any favorite strawberry scents? Feel free to share recommendations in the comments! I Profumi di Firenze Plenilunio is $110 for 50 ml Eau de Parfum. For buying information, see the listing for i Profumi di Firenze under Perfume Houses. 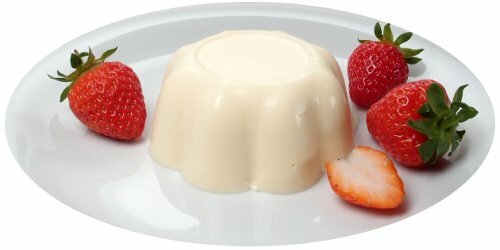 Note: top image is Bavarian cream with strawberries [cropped] via Wikimedia. DSH AMOUSE BOUCHE. Delicious strawberry jam, with buttery brioche in a woody floriental. Do I sound like I like it? I love it. Oh stop. I think I need to order a sample of this. I am so far behind on the Cartier “Heure” line!! and that sounds like one I’d enjoy. I remember like Montale Roses Elixir when I smelled it several years back. It is full of sweet roses, strawberry jam and citrus. I also remember one of the stages of L’Artisan Voleur de Roses smelling of strawberries. You know, I regret not spending more time with the Montale line when I had easy access to it. It was just sort of overwhelming! I do love Voleur de Roses for its weird plum-and-dirt thing. I was wondering if it reminded you of Hanae Mori Butterfly until I got to the bottom paragraph. Strawberries and vanilla sounds a little too sweet for me, though perhaps there’s a time and a place to want to wear something like that. I gravitate toward the sweet and comforting in winter, in particular. Yes! It feels a little lighter than the Hanae Mori, which I remember as being *very* creamy and sweet. I like having a few sweet-tooth scents on hand, even just as samples, for those moods. I. Want. It. Oh! The Bavarian Cream, not the perfume! hah! I was happy to come across that photo; it seems to fit this fragrance. And it does look delicious! I love Hilde Soliani’s Fraaagola Saalaaata but it’s sooooo expensive! Is this anything like that?? I haven’t smelled that one — I actually haven’t seen this line in person! Wasn’t there a Tulip one, too? Oh yes! Behind the counter. Now I remember. Thanks, GoddessRena! I think ‘angel mousse and gardenia spasms’ should win a phrase award in the faux copy contest! At the moment, this red-fruit kind of scent is represented (in my collection) by Mure et Musc Extreme. My favorite strawberry scent I only have in sample form: Imaginary Authors’ Cape Heartbreak – it’s an intriguing mix of strawberries and pine! Every perfume-lover should own a bit of Mure et Musc! This was the one that introduced me to niche perfumery, back when my mother started wearing it in the 90s. Cape Heartbreak is a great pick! My first bottle of scent I ever bought myself was a strawberry scent from the drugstore. I doubt I was even ten years old. My neighbor yelled at me because her son was allergic – as if I should have known that. But it put me off strawberry scents for years. I don’t think I wound up with a strawberry note perfume until recently; I now have and enjoy Imaginary Authors’ Cape Heartache and Slumberhouse’s Sadanne. And I don’t live anywhere near that neighbor, or her son. I bought strawberry oil from The Body Shop way back when “No Animal Testing” was considered cruelty-free and eco-friendly. Unfortunately, I was severely allergic to it and it put me off wearing perfumes for a good 20 years! It is ironic that a mean sounding persom ended up becoming a pastor! I’ve sniffed Sadanne — it *is* fun! This sounds like it’s worth a try although I am somewhat nervous due to the aforementioned bad reaction, albeit 20 years ago! I remember having a bit of a rashy reaction to a Body Shop oil (Dewberry? Alanya?) — maybe they were really too concentrated for us to be using on skin?! Perhaps…but they were marketed to put on skin directly. If I recall, the bottle was a squat little bottle and the screw top had a plastic wand attached to it. Oh yes — I loved that little bottle with the black cap. I agree, they were definitely sold as perfume oils to be applied directly to skin — but maybe The Body Shop should have diluted them a bit first!